There are thousands of coaches available in Canada, some certified, some not. Certification ensures that a coach has received coach training through a recognised establishment and has been assessed against a comprehensive set of coaching competencies. Additional credentials such as ACC (Associate Certified coach, PCC professional Certified Coach and MCC, Master Certified Coach) attest to the amount of coaching experience a Coach has gained. Membership of a professional association such as the International Coach Federation, ensures that a Coach is following a code of ethics and standards. With so many variables to consider, how do you make the selection to ensure your organization gets a good return on investment? Since coaching is a one on one interaction, the chemistry between the coach and individual is critical. Individuals can get a good sense of the coach’s background and experience by reviewing a bio. It is important for individuals seeking coaches to be involved in the selection process. Coaching can be very personal, therefore confidentiality, mutual respect and trust are key factors. Depending on the needs, most firms offering coaching services can refer two or three coaches for selection purposes. Trained coaches will follow a process and seek to understand the coaching assignment through strong listening skills and by asking the right questions. The role of the coach is to help the individual find the right answers, through probing, listening beyond what is said, taking risks and pushing their clients as appropriate. The role of the coach is not to give advice on the direction to be taken, rather to help the individual work through their options. A coach will help the individual determine the desired outcomes from coaching to ensure that coaching stays on track and provides a tangible return to both the individual and the organization. References – with appropriate confidentiality considerations, the references can attest to the outcome focussed work your coach has done in the past. Process – choose a coach that has and uses a proven coaching process, which includes goal setting, action planning and assessment of outcomes. In summary, rest assured, coaching can yield powerful results when managed effectively! Rehana Doobay is the CEO of The Talent Company (www.thetalent.co) and is responsible for creating, communicating, and implementing the vision, mission, and overall organizational strategy. Rehana also leads The Talent Company’s Leadership and Executive Coaching Practice. Rehana has over 20 years of experience in corporate HR roles supporting clients in information technology, financial services, retail and sales. Her areas of specialty include organizational effectiveness, leadership, employee development, talent attraction and retention. She previously held the position of Vice President, Human Resources and Chief Talent and Diversity Officer at Shoppers Drug Mart and Vice President, Human Resources at American Express. Her years supporting Fortune 500 companies across Europe and North America led her to pursue her passion for coaching, gaining certification in Executive Coaching from Royal Roads University. She is attentive to the individual needs of her clients and their organizational goals. As a coach, she is able to work with clients to refine a clear roadmap to success that is reflective of their personal potential and business needs. Rehana is committed to helping individuals and organizations reach extraordinary outcomes through coaching and leadership development. Talent management technology is evolving. Social features that drive collaboration, enable real-time feedback, and give employees (and their bosses) more visibility into what’s going on in their organization–furthering the trend towards consumerization of workplace IT. Early adopters of these socialized talent management technologies are seeing some immediate value-adds. Marketing services firm Dominion Enterprises has always had an open door policy. But leadership struggled to sift through and act upon all the input they received. They needed a central platform for gathering, sharing and developing ideas. “While we had channels for feedback and input, it was hard to get traction around ideas,” explains Susan Blake, VP of HR. After giving UserVoice Feedback software a test run in one department, they rolled it out company-wide in March. 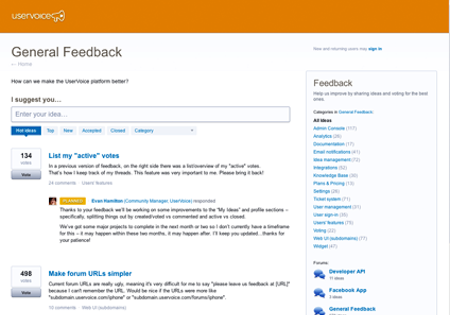 Uservoice allows employees to submit ideas, vote on others’ ideas, and discuss them. The software had immediate impact, giving management the tools they need to give their open door policy new life–with employees from every department offering suggestions for improving products, policies and processes. Furthermore, by showing employees that their feedback results in real changes, they’ve seen a spike in employee engagement. “To say UserVoice was a catalyst is an understatement,” says Blake. 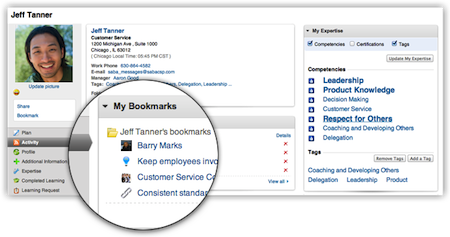 Gone are the employee directories of old, replaced with a strategic tool for both employees and leadership. You can still find contact info for colleagues in another department, but innovative products like Saba’s People Cloud have offer something more akin to an interactive talent directory. Employees can create detailed profiles–listing skills, competencies and interests (relevant to their current roles or their career goals). Colleagues can search for experts in the company, and garner attention from peers and leadership by regularly lending expertise hand or sharing articles of interest. Managers can find viable candidates internally for key hires. One of social talent technology’s greatest value-adds for employees is in career management functionality. 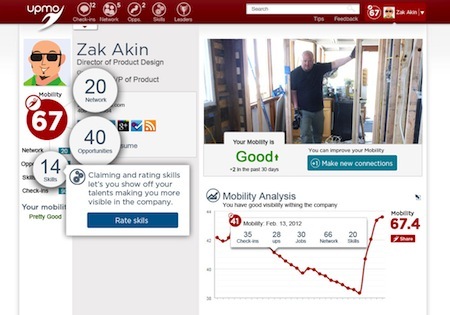 Systems like UpMo–the first enterprise talent network–are offering users a unique approach to career pathing by putting employees in the driver’s seat. With UpMo, employees grow their internal network and their skills profile simultaneously, making them more appealing candidates for opportunities in the organization. Like other social talent technologies, there’s even a bit of gamification built in, which encourages usage and makes the process more engaging. Employees can give each other shout-outs for a killer meeting (a +1 in Presenting), or thanks for explaining Cloud computing (a +1 in Cloud). This highly social product, which launched a free version last week, brings new energy to career management by keeping employees focused on growing within their organization. While the products described above offer significant value, social technologies as applied to talent management still have room to evolve. For example: Seamless integration with other systems (e.g. simply having a single sign-on across systems could greatly boost user adoption). What do you think are the greatest opportunities for social technology to drive innovation in talent management? What hurdles are there to clear before we see widespread adoption? Kyle Lagunas is the HR Analyst at SoftwareAdvice.com—an online for reviewing and comparing talent management software. On the surface, it’s his job to contribute to the ongoing conversation on all things HR. Beyond that, he makes sure his audience is keeping up with important trends and hot topics in the industry. Focused on offering a fresh take on points of interest in his market, he’s not your typical HR guy.